Wells Alexander Watkins Long, known as Alec, was born in Frampton on 18 August 1891 to George Alexander Watkins Long, a mariner, and Agnes née Ayland. The family, who used the name Watkins rather than Long, lived in Lake House; Alec was the fourth child of five. 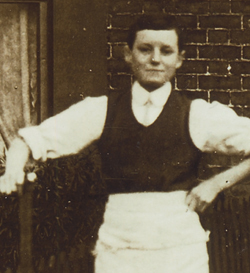 The 1911 census records him as a grocery assistant, as shown in his photograph, probably taken a little earlier, outside the shop run by William Henry Goodman at the top of the village green. The Goodman and Watkins families were well known to one another for both were heavily involved in the running of the Congregational church at Frampton. However, in April 1913, Alec decided to leave his roots and he sailed from Bristol to Halifax, Nova Scotia, on the RMS Royal Edward, a passenger ship belonging to the Canadian Northern Steamship Company. It seems that he intended to make his life in Canada, travelling on to Calgary where he settled and found work. As the war progressed, Alec was keen to help his new country in its support of Great Britain, and he enlisted on 5 November 1915 at Calgary to serve with the Canadian Expeditionary Force in France. Unfortunately, no records of his wartime service have been found, but it is worth noting that the Canadians formed a separate Corps and fought together; therefore it is likely that Alec was involved in the battles of the Somme, the major Canadian victory at Vimy Ridge and at Passchendaele. Alec's war service is commemorated on the plaque in Frampton Village Hall. He is known to have been back in Frampton by September 1921, when he was fined 5s. for riding his bicycle without lights and was described as a coal merchant. In the summer of 1922 Alec married Lottie Evelyn Rowles, their marriage being registered in the Bristol area. They settled first at 12 Whitminster Lane (one of the newly-built council houses) with their two daughters, Wynne Alexandra and Alexandra Marguerita, before moving to Westmont, Bridge Road, from where Alec ran a haulage business, W. A. Watkins & Son. Wells Alexander Watkins died at home on 15 December 1965 and was cremated at Gloucester Crematorium.